Welcome to The Salt Table’s Georgia Wine Tasting Room. 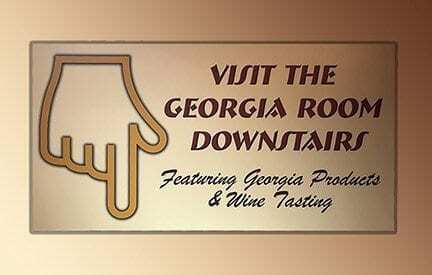 Since 2012 this sign has proudly directed Salt Table customers to the lower level and the Salt Table’s Georgia Wine Tasting Roomsm featuring Georgia’s finest, award-winning wines. From sweet to dry, Georgia offers the best wine available. Many of these amazing Georgia wines are available exclusively at The Salt Table in Savannah. 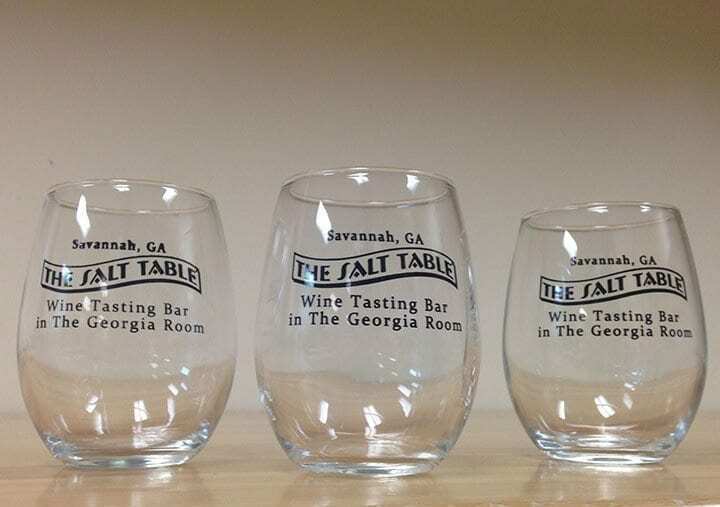 Plan to stop in The Georgia Wine Tasting Room at The Salt Table in historic Savannah during your next visit to Savannah. 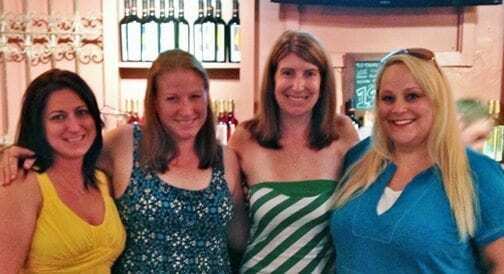 The Perfect Girl’s Getaway Stop in Savannah! …especially those who love to sample fine wine in a truly awesome environment! 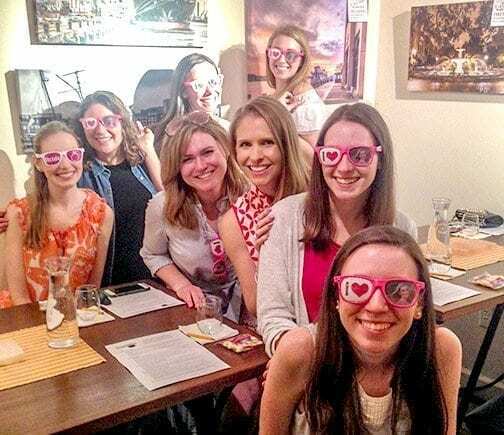 Whether you’re escaping on a Girls Getaway, a bridal party, a small group of friends, or a couple visiting the beautiful and historic city of Savannah, a visit to Savannah would not be complete without a stop at The Salt Table’s Georgia Wine Tasting Room featuring awesome Georgia wine. You can sample dry reds and whites from the Georgia Mountains or sweet and fruity wines from the local Savannah area. This is the only wine tasting room in Savannah where you can sample these exclusive wines … all from Georgia. And, all of the selections come from international, award-wining Georgia wineries with fruit grown right here in Georgia. 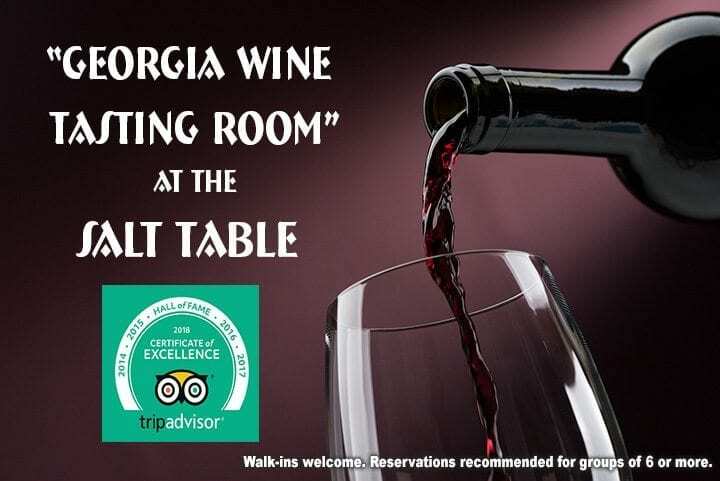 The Salt Table’s Georgia Wine Tasting Room is so very pleased to offer a fine selection of extraordinary, award-winning wine from throughout Georgia! Since opening the Georgia Wine Tasting Room in our lower level in 2012, The Salt Table is the only shop in Savannah with this exclusive selection of these fine Georgia Grown wines. And, better yet, The Salt Table is the only place in South Georgia that provides wine tastings of these internationally award-winning award-wining selections! Georgia wines range form very dry to super sweet, and include varietal Reds, Whites, Rose and Fruit Wines. So, if you are looking for a fun and informative time while in Savannah, try tasting the best of the wines from Georgia. 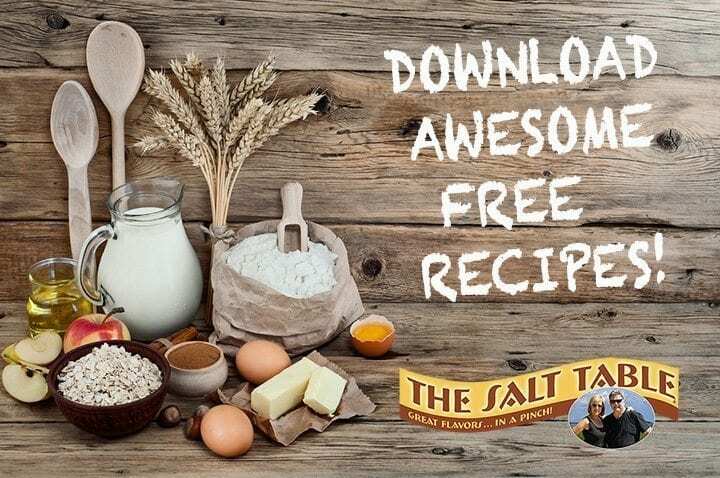 Simply purchase a wine glass for $10 and you will receive six generous pours compliments of The Salt Table, and you keep the imprinted collector wine glass. Walk ins are always welcome at The Salt Table’s Georgia Wine Tasting Room during normal business hours after noon until 30 minutes before closing, first come, first served. Reservations recommended for groups of six or more. Tastings during business hours generally take 15 – 30 minutes depending upon the size of the group. Tasting includes six generous flights of GA wine samples from a list of about 20 Georgia premium wines with most being exclusive to The Salt Table. All wines are from award-winning wineries and vineyards. The $10 price is for the special collectors wine glass. The six samples are selected from the complete list of premium wines and these are free with each purchase of the wine glass. Note: Under Georgia laws, all people who sample must show a valid ID and must be at least 21 years of age. The Salt Table also sells all wines by the bottle. Wine tasting by reservation. 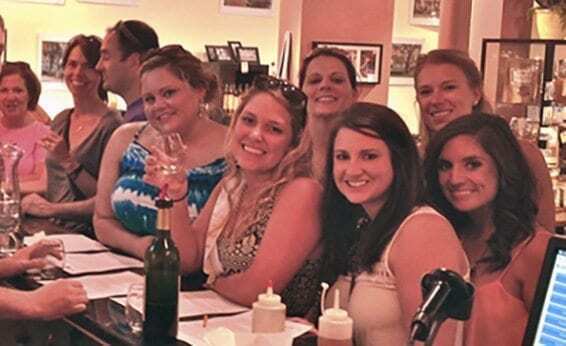 Reservations are recommended for groups of six or more at The Salt Table’s Georgia Wine Tasting Room. Tastings during business hours generally take 15 – 30 minutes depending upon the size of the group. Tasting includes six generous flights of GA wine samples from a list of about 20 Georgia premium wines with most being exclusive to The Salt Table. All wines are from award-winning wineries and vineyards. The $10 price is for the special collectors wine glass. The six samples are selected from the complete list of premium wines and these are free with each purchase of the wine glass. To make a reservation submit the form below. 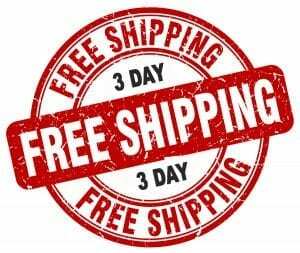 If you don’t hear back from us within one business day, call 912-447-0200, just in case.